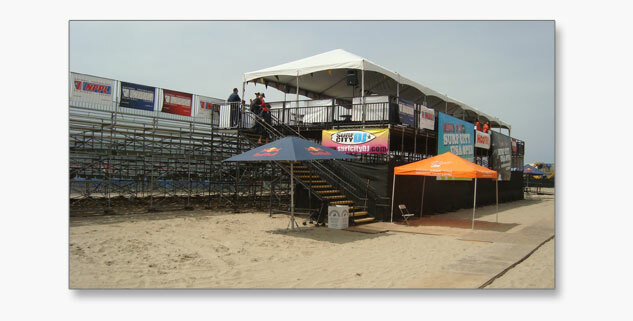 Mike Brown Grandstands offers a wide variety of platforms that can be used in conjunction with our bleacher units. Examples include dining risers for tables and chairs, VIP areas added to the front or back of bleachers as well as press, camera, and coaches platforms. MBGS also provides award and graduation stages and platforms, along with stairs and ramps for ADA access. Our modular platform systems are often used for award and graduation ceremonies. Along with the decking system, we offer a variety of access stairs, ramps, and guard rails to compliment the finished structure. Another use for a platform system is the construction of single level and tiered hospitality suites for tables and chairs. Great for enhancing the event experience for attendees or corporate clients. Platforms attached to bleachers and chair risers are often used to create VIP areas seperated from general seating and used to provide lounge, dining, viewing, and catering areas. Need a stage or technical platform? Our decking system can be used to provide elevated performance decks as well as platforms for technicians, spots, cameras, and more.